Prime Minister Justin Trudeau has publicly shared a vision of a plurinational state brought about through truth and reconciliation. He has expressed hope that Canadians are ready to rectify past wrongs and undo the legacy of colonialism by using the United Nations Declaration on the Rights of Indigenous Peoples (UN Declaration) as “a way forward” to achieve self-determination, dignity and respect for Indigenous peoples. Many have questioned the government’s commitment to reconciliation built upon nation-to-nation and government-to-government relationships. Governmental support of major development projects such as the Trans Mountain Pipeline Expansion, against strong opposition from some Indigenous voices, has created skepticism. Many Indigenous leaders have expressed concerns about how changes to a number of laws currently making their way through Parliament will impact Indigenous people, and whether their concerns are being fully heard by government. With respect to the government’s rights recognition and implementation framework, some Indigenous communities argue that the focus should be on the affirmation rather than the mere recognition of rights that are already enshrined in the UN Declaration. This paper looks at the history of Indigenous treaty making in Canada, the history of the courts’ statements regarding Crown sovereignty, underlying title and legislative power, and how the UN Declaration might lead Canada and Indigenous peoples toward genuine nation-to-nation relationships. 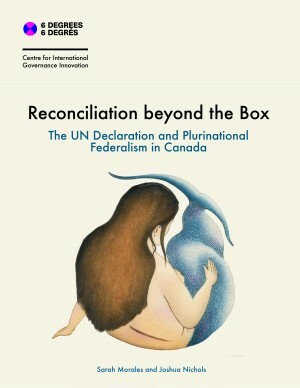 Reconciliation beyond the Box: The UN Declaration and Plurinational Federalism in Canada was produced with the Centre for International Governance Innovation (CIGI) and authored by Sarah Morales and Joshua Nichols. Read the full report here or by clicking on the image below.